How many experiments have you carried out in your Isothermal Titration Calorimeter during the last years? Do you know that you can reuse them to obtain kinetic information? 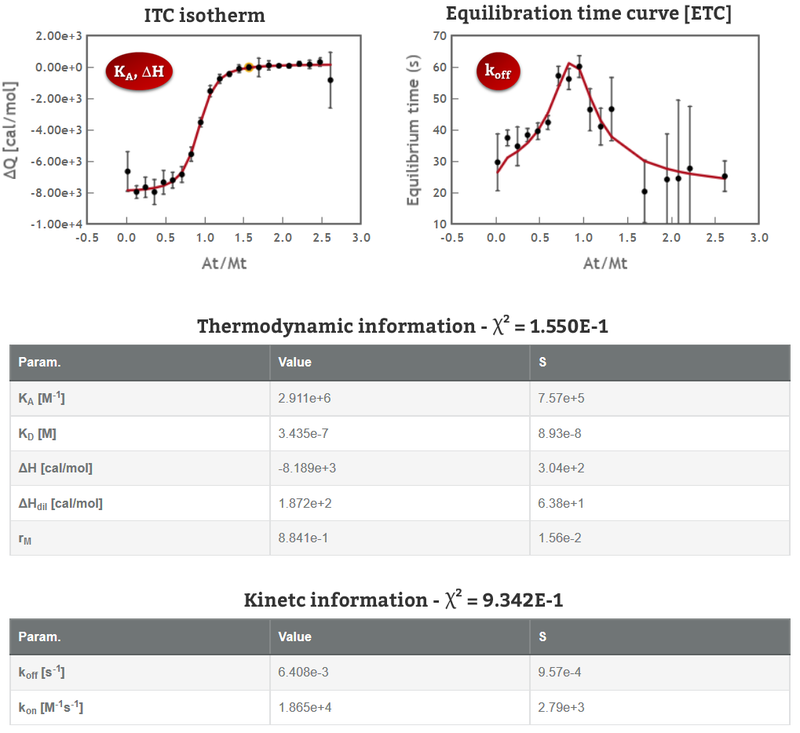 KinITC is a methodology recently developed by Philippe Dumas (CNRS, France) to simultaneously get kinetic and thermodynamic information from a standard ITC experiment. The current implementation of kinITC in AFFINImeter is valid only for 1:1 interactions but we intend to extend this for more complex systems in the near future. If you have performed experiments of 1:1 interactions in the past, bring them back and use KinITC to get kinetic constants (kon and koff). Under ideal conditions (perfectly clean sample cell, accurate characterization of the response time of your instrument and sufficiently slow kinetics) the resulting values are expected to be equivalent to those obtained by surface plasmon resonance (SPR). The whole process takes just a few seconds and you can analyse multiple files simultaneously. Blow the dust off your old ITC binding experiments! Go to AFFINImeter! (1) Burnouf D1, Ennifar E, Guedich S, Puffer B, Hoffmann G, Bec G, Disdier F, Baltzinger M, Dumas P. kinITC: a new method for obtaining joint thermodynamic and kinetic data by isothermal titration calorimetry. J. Am. Chem. Soc. 2012 Jan 11; 134(1):559-65. doi: 10.1021/ja209057d. Epub 2011 Dec 16.